Solar technology is an an incredible resource and now more than ever people are seeing the need to invest in the best portable solar panel they can find. Solar technology has brought us countless new opportunities that many people are just beginning to realize they can incorporate into their lifestyle. They can be used to charge small, portable devices or as an energy supplier for homes or RV campers. We sifted through hundreds of the best portable solar panels and chargers, narrowing it down to top models so that we can help you buy the best product for you. 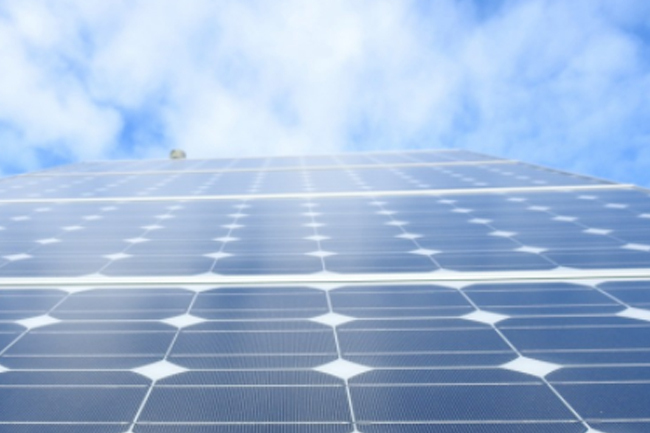 Read on for our very in-depth solar panel educational guide. The buying guide includes tips on what to look for, how to estimate the wattage that you need, and how to protect your devices. The Renogy 100 Watt 12 Volts Starter Kit is effective at Generating an impressive quantity of power. The Monocrystalline solar starter kit is inexpensive and specifically designed for people who are just getting into solar power for the first time. The Starter Kit is great for off-grid applications, such as RVs, trailers, boats, sheds, and cabins – providing many benefits and contains all of the elements you will need to expand your current system or will to make camping much simpler. 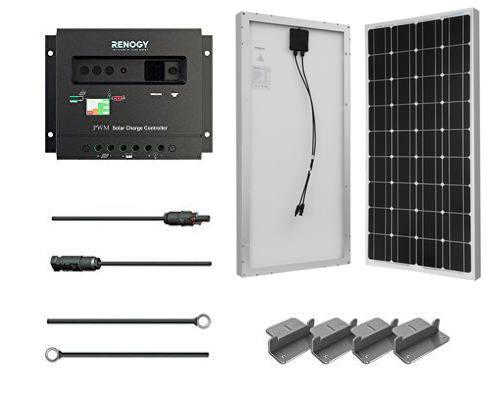 The kit comes with everything you need: a Renogy 100W 12V Monocrystalline Solar Panel, a charge controller, an adapter kit, cables and brackets. The device comes with exciting new updates that allow the system to be expanded to up to 400 Watts under ideal conditions. If you set up the device early on the day and have bright, Sunny sky you are able to generate around 500Wh daily. This is enough to fully control a 50Ah battery out of 50 percent in only 3 hours! You’ll also be able to take advantage of the negative grounding controller. This helps to ensure safety of the use of the device, especially in cases where you might need to use it on a vehicle with a battery negative. The solar panels are EL tested and are guaranteed not to have any hotspots. In addition it can withstand high winds and heavy snowfall. Unlike many solar panels, this panel has exceptional performance in low light environments. It has what we consider to be the greatest layout on the market and is able to generate an impressive quantity of power which can allow you to maintain your own RV or camper van up and running effortlessly. In addition to this, the kit also comes with a convenient 8 ft cable that allows you to connect the charge controller and battery easily. You’ll Have the Ability to set the kit up at a distance in case you need to park your RV In a place that does not have enough sun exposure to properly control the device. * Well built and would last for a long time * The wires don’t connect to the charge controller very easily. The Anker 21 watt panel kit is flexible and extremely light makes it a great power source for your electronic devices whether you’re constantly walking, driving, or sitting still. It folds away beautifully and is quite thin too. 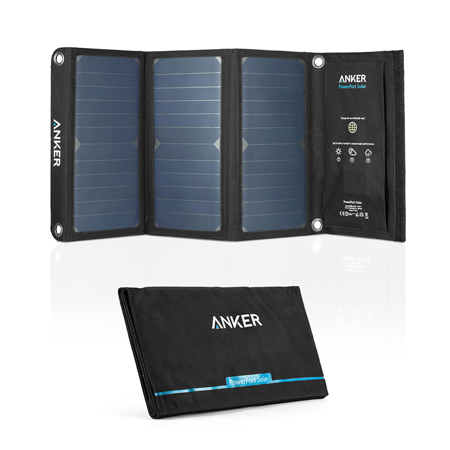 Portable solar chargers can be tricky when it comes to which devices they will recognize and charge properly. Not so with the hyper-intelligent PowerIQ built right into this accordion-style folder from Anker. The device will automatically detects the ideal output minimizing charge time and give your equipment enough power. The folder is made of 4 panels combined to create a 14 watt monocrystalline solar array that gives you 2.4 amps per port, and a total of 3 amps overall under direct sunlight. The solar panels are from a top quality manufacturer in the states and are protected by industrial-strength PET polymer. It also comes with Anker’s standard short circuit and surge protection technology to help protect your devices. You get 2 USB power ports that allow you to charge up to two devices at the same time. The charging speed that is outputting through the USB Ports depends on the amount of light each of the solar panels is receiving. With that said, the charging speed that the USB Ports are able to Output is really good. Both of the USB ports are able to Output 5V/2.4A of charging speed. The Max Output is 3 Amps. So charging 2 smartphones with sunlight hitting all the solar panels is going to give a fast charging experience. You can even charge tablets like iPads at their max charging speeds of 2.4 Amps, and if you want to charge 2 iPads at once, then each one will be receiving 1.5 Amps of charging power. Do be careful though, Solar Charger will not charge the following devices: iPod nano, iPod Classic, iPod Shuffle, HP TouchPad and Asus tablets. The 4 solar panels are encased and separated by a mesh canvas. This durable outside construction is made of rugged polyester canvas shell for fighting off weather or sharing a pack with a busted water bottle. It is great for carrying around in both hot and cold temperatures. The panels fold into themselves nicely and the product generally feels well made. There are 2 stainless steel eye holes on each corner-end of the product and 2 more on the third panel down. This is great for hanging from a tree, a tent, a poll – anywhere really, be creative! The gadget is excellent for long-term use and includes a slick and innovative design. Their innovative chaining technology helps enhance the charging period of the apparatus so that you may get your energy fast and economically. All you need to do is set the device with a different Goal Zero power pack and you’re going to have the ability to control your equipment anytime that you will need to. The unit works with anything which utilizes a USB cord. 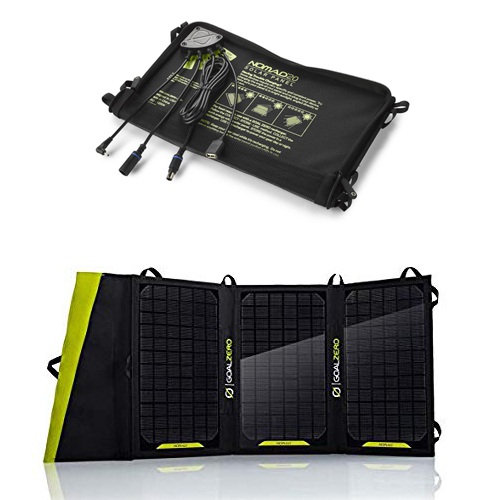 The Goal Zero Nomad 20 is a outstanding portable solar panel with an integrated junction box plus a smart charging processor that permits you to control your electronic equipment with solar electricity through USB interfaces. The mobile solar panels could be combined with some of Goal Zero’s power packs like the Yeti 150, Yeti 400 or even the Venture 30. The kit employs monocrystalline technologies to provide 20 W of power. It’s very important to mention the Goal Zero Nomad 20 doesn’t save energy , another battery pack alternative is required to keep the surplus solar power. The item is meant to function as a mobile solar solution to electricity 12V devices like smart phones, GPS, iPods, and Goal Zero power packs. Goal Zero continues to be present in many crisis situations across the nation, and this alternative has provided security and power in states where the electricity grid can’t offer electricity to the area. Other product dimensions are offered in 7W and 13W. Portable solar panels can free you from the grid yet allow you to power all of your portable gear and electronics without a fossil fuel-powered generator. While solar panels are simple to prepare and use, choosing the right one takes a bit more consideration. With a range of solar panel manufacturers available on the marketplace, you want to understand if the product you’re buying will meet your energy needs. What Are Mobile Solar Panels Used For? Flexible, semi-flexible and bendable panels can be installed, uninstalled and transferred between rv’s, caravans, boats and other locations with surfaces. However, they could only bend around a 30 degree angle, and because they are produced with plastic/laminate – they are not intended for carrying around or for wear and tear. The upside to flexible solar panels is that you typically pay less for a wattage than a panel that is folding. As you’re able to unpack/pack up them really readily, and can be carried around in a backpack for hiking and adventuring activities such as snowboarding. Due to Their extra portability, you will generally pay more for higher Wattage foldable solar panel when compared to a similar flexible panel. How long solar charging takes? You will collect the maximum power from the sunlight on bright, transparent days. Nevertheless, solar panels utilize UV, IR and visible rays from the sun that can penetrate through the clouds. Even Though the efficiency of the solar panel will fall in cloudy conditions, you will still be able to power from sunlight. Also, putting your solar panel angled toward the sun can highly Increase the efficiency. Just set it up and let Mother Nature do the rest. Can my device run directly from a solar panel? Little USB devices such as cameras of MP3 players need 1-2.5W of capacity to charge. Smartphones and tablets have a greater energy requirement, typically around 5W of continuous electricity. A 7W rated solar panel is only going to create 5W in excellent sun conditions, and since smartphones are rather picky about their electricity requirements, they could stop charging when there’s a disturbance in continuous electricity – such as when a cloud passes by overhead. This means your phone could be sitting out there and not charging. For the best experience, we recommend using a battery as a buffer, instead of charging directly from sunlight since they give you a constant charge no matter what is the weather conditions. How to choose The best portable solar panel for you? 2 Watts is the bare minimum to maintain cell phones & iPods Phones (30-50% charge on a sunny day). 10 Watts is our recommended minimum for notebooks and typical DSLR camera usage (1-3 battery charges on a sunny day). 30+ Watts is the range for laptops, Cameras, and video equipment. Crystalline panels are more efficient, meaning more power per square inch, but they need strong direct sunlight for greater performance. Thin-Film panels are more sensitive, and will enable better charging in higher latitudes and in partial shade. Weather-resistance is an absolute must. Water-resistance is the best. • Packability is crucial. These panels are supposed to be ‘portable’ solar panels, so make sure to check their total weight. • Should include straps, handles, grommets or loops to make it easier to attach to backpacks, bikes, tents, etc. Solar panels can be utilized in two main variations, based on your power requirements. Fixed solar panels will be mounted on the roof of your truck, boat, caravan or 4WD to consume sunlight while traveling or whenever your automobile is parked in a sunny place. Many caravans have a roof area large enough to maintain a system that covers nearly all of their power needs and you will not have to do any further setup. The drawback of fixed solar panels is in their positioning – since they’ll be placed flat throughout your car or truck and you might not always park in direct sun they shed around 20 percent of the electricity they could possibly produce in a day. With portable solar panels, this is less of an issue. This panels can be set in the sun and moved to trace its arc while a cable runs straight back to your own battery. This allows you to position the according to the sunlight and generate the largest amount of power from your panels. However you will have to spend more time for setting up and packing them.